WHEN IT COMES TO ONLINE TRAINING, ONE SIZE DOESN'T ALWAYS FIT ALL. 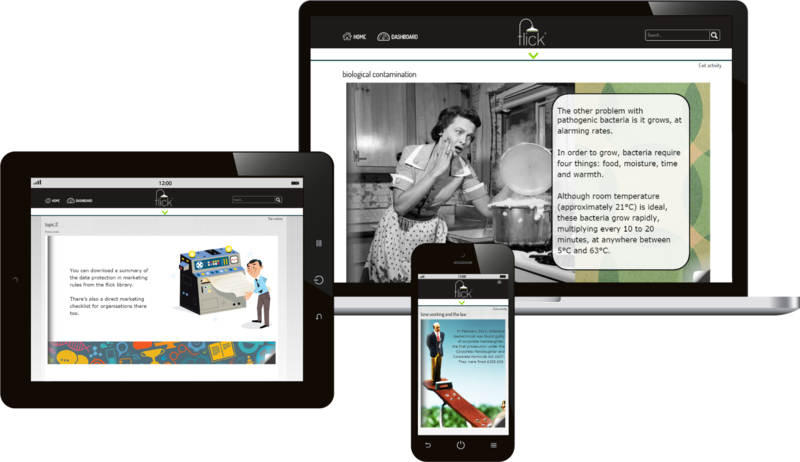 NOT TO WORRY, FLICK CAN DESIGN TAILORED E-LEARNING THAT'S A PERFECT FIT FOR YOUR ORGANISATION. We work with a wide range of clients to create tailored e-learning solutions to meet specific training requirements, and build them in a style and fabric that reflects the cut and culture of that organisation. Alternatively, we can take one of our existing off-the-peg courses, make a few alterations here and there, and dress it to look like it was tailor-made for you. Take a look or download our Production Process guide to see how we go about creating bespoke e-learning courses. Hear it, see it, learn it. Stamp your brand all over our content and pass it off as your own. Snips and minor text or image changes here and there to align content more generally to your sector, organisation or environment. Swap logos if you wish. Make cuts and alterations to content throughout to relate it specifically to your organisation, and possibly add an additional topic for any extras you want to include. Once again, dressed up to look like you made it all yourself. Host your course here on the flick platform or alternatively, order it ‘to go’ and upload it on to your own Learning Management System. Will we have to buy a flick subscription? If you want to host your course on the flick platform, then yes, you’ll need to buy an annual subscription based on the number of learners you’re going to put through the training. The good news is that they’ll also have access to all the other courses in the flick library as well as your tailored course. Do I have to host the course on the flick site? No. If you want to use another supplier, or are lucky enough to own an LMS, we’ll supply you with the SCORM packages (that’s the files containing your course), and you’re free to host your course elsewhere. What content do we have to provide? Anything that will help us to understand the subject matter, any relevant documents and any content that you want us to include. We don’t expect the finished copy, and can work from either mountains or morsels of information. Do I need to provide you with imagery or other materials? Not really, though we may ask you for images if we think they’d be good to include, or if you’d like us to include certain images, you can supply them to us. We will, however, ask you to supply us with your logo and brand guidelines, if you’d like us to include them. If you'd like to know more about flick's tailoring options - call us today on 0203 814 0492, email us at hello@flicklearning.com or chat to us right now using our live chat (bottom right of your screen).